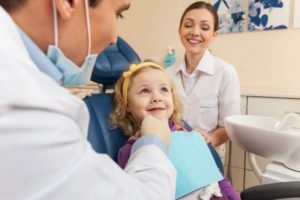 When Should We See a Children’s Dentist in Long Island City? Just as your child’s first steps and first words are important, so is their first dental visit. The very first dental visit marks the beginning of a great oral healthy journey from infant, to adolescent, teen, and even as an adult! You might be thinking, “They’re just baby teeth…they will fall out eventually.” But in reality, it’s important to start taking care of their little smiles early on. Learn more about when you should bring your little one to see their children’s dentist in Long Island City here in this week’s blog post. When Should You First Bring Your Child to Visit the Dentist? Dentists and pediatricians alike recommend that your child see the dentist by the time they have their first birthday. At the very latest, your children’s dentist likes to see children by the time that they have their first teeth budding out of the gums, just to make sure their smiles are developing correctly. It’s true that baby teeth will not stay forever (no matter how cute they are!). They are placeholders for their adult, permanent teeth. This makes is just that important to care for your little one’s first teeth because they lie the foundation for adult teeth to develop into and how they develop. Plus, don’t forget what baby teeth do for your little one now. First teeth should be respected and cared for because they help your son or daughter eat a healthy diet and learn to speak clearly. What Is the First Dental Visit Like for My Child and I? The truth is that your child’s very first visit won’t be long at all. Your child’s dentist will use this time to create a positive experience for your little one, gaining their trust from a young age. This also promotes comfort in the office so that they can become familiar with the staff, dental chair, lighting, and some tools. The appointment may start with a dental exam. Just because your baby isn’t used to strangers being in or around their mouth, they will need to get used to their dentist being in their personal space. Plus, your dentist will be able to check on the development of their mouth. If your child is comfortable and willing, the dental hygienist will professionally clean whatever teeth are currently in the mouth. As mentioned above, your child’s first dental appointment is relatively quick. It’s just the start of a great relationship between you, your child, and your child’s dentist/dental team. Here at LIC Dental Associates, one of the greatest joys we have is seeing little kids visit our office. Not only are they bright eyed and curious about their dental health, but they love hanging out with our friendly staff. Contact us today to learn more about how we can help your family.